What’s a biblioblog, and what is not? How do you order them? As an example of an issue of the first type, the “Logos Talk” blog would rank number two in the list above if it were classified as a biblioblog, but it has no place at all if it isn’t. 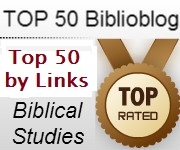 This is necessarily something on which people might disagree, but I’ve stayed almost identically close to the classification of “biblioblogs” at the official top 50 site (with the subtraction of Logos Talk and the Bible Works blog and with the addition of Jesus Creed and a couple others being the exceptions). In my last post, I gave an ordering by Alexa Traffic rankings. Beyond the question of the correspondence of these rankings with actual traffic of the blog (a real one, especially when dealing in small numbers), there is also the more serious problem that there is no separate data on certain blog publishing systems such as Patheos and LiveJournal, which doesn’t do justice to the popular blogs there. At the risk of using a set of data problematic in a different way, this list is a bit more inclusive than the last one. If it still doesn’t include what you think should be there or if you know another good method of constructing an order, please let me know. Where is Faith & Theology by Ben Meyer? Sir Not-Appearing-in-this-List… would come in at 17. Thanks for mentioning the blog. It’ll be in future rankings. How do you distinguish .ca from .com or for that matter .uk.co? My blog as meafar.blogspot.com shows significant differences in linked domains though the addresses resolve to the same result. My blog on the list (diglot.wordpress.com) has the old web address that I haven’t used in years. My actual web address (diglotting.com) would surely make the Top 100! Indeed, it makes the top 50. Thanks for pointing this out. Observatório Bíblico has moved. It is located, since March 8, 2010, at http://blog.airtonjo.com/. Would my lowly blog make the cut? Yes, it would land in the top 50. Thanks for mentioning. I’m interested how freedominorthodoxy.blogspot.com would rank? Sure thing! I will add it to the next quarterly report.